Dwight David Eisenhower (1890 - 1969), also known as "Ike" was the thirty fourth United States president from 1953-1961. 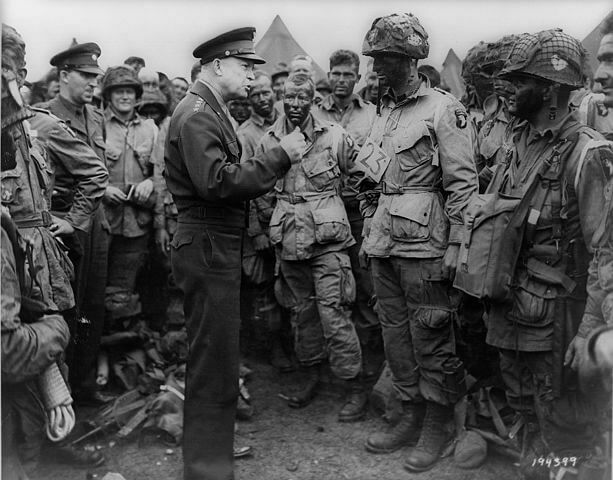 He was a five-star general during World War II, serving as supreme commander of the Allied Expeditionary Forces, before serving as President Harry Truman's Army chief of staff. Eisenhower was a Republican and campaigned against "communism, Korea and corruption," winning the election by a landslide against Democrat Adlai Stevenson. He effectively ended the power of the New Deal Coalition which had been in place since President Franklin D. Roosevelt, yet he expanded the social security system. His goals in office were to keep pressure on Russia and reduce the federal deficit. He openly opposed Joseph McCarthy and through executive privilege ended the era known as "McCarthyism." Eisenhower authorized the largest military build-up the nation had ever seen, presiding during the Korean War. Yet in his 1961 farewell address to the nation, he cautioned against the dangers of "the military-industrial complex" which remains his legacy. Among his favorite authors was Zane Grey. Visit American History and the African American Library for other important figures and historical documents which helped shape America.